Well since Ross left (shaking my fist at the cruel Fates) I've been the one putting together the gaming geeklists. Been out of town on business a lot in September and October and with things starting to settle down a little bit, I decided it was time to jump in and do the last couple of geeklist while a had a moment to breathe today. First up is October 26th...Let's get to the games. So there we all where with monsters that were dressed up in costumes. At the end, Julia rose as the most powerful monster of them all. Next Chris H., Patrick, Todd, and Julia moved on to play Walking Dead. I think they won, but will look to them to provide more color commentary. The rest of us went off to play my new favorite of the year, "Places of Carrarra" for Kevin it was his first chance to play it, but I understand he liked it a lot. If you know Kevin, he is the resident "Mikey" of the group... (He likes it, hey Mikey) but Kevin is always a blast to play with as he never sugarcoats how he feels about a game. A quick (and eloquent) victory dance broke out around the table. Had just a few minutes before Walking Dead was ready to finish up, so we grabbed this perennial favorite off the shelf and broke into a quick game of Cheeky Monkey (or as Ross calls it MMMMMMMMoooonnnnkkkkkkkeeeyyyyyy). Poor AWAD could not catch a break as both Kevin and I were stealing from his stacking constantly. And if we were not grabbing his animals, he was busting. He should know that Hyenas always always travel in pairs. When the dust cleared, Kevin was the head Zookeeper. Time for one more big game before the group would have to break up so we moved onto two tables. The games? If you looked closely at the last image, you might have wondered if we played something other than this new classic, but nope, we went right to this one. Another of my favorites from this year. We jumped in and I just got smoked. Had the mermaids and I just could never get enough traction to really make an impact on the game. Todd took the giants I believe and he and Aristides battled head to head for most of the game. Kevin gave a great accounting for himself and can mighty close to taking it all. Julia, Chris H., and Patrick went on to play some Suburbia. Picked this game up at GenCon from Ted A. and he was kind enough to sign my boards. 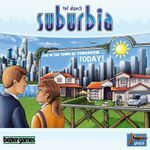 Was also able to pick up the upcoming expansion Suburbia Inc. as a pre-order. All the people at Bezier Games were all very nice and I wish Ted and his team the best for the future. Anyway (I do tend to get distracted that way)it seems that a good time was had by all playing this one again. Once again Julia arises victorious. So we now jump ahead a few weeks on to November 9th. Dave D. came today and it was really good to see him. We also added a new member to our board gaming group (Corinna) and she was very nice. as one of her all time favorite games. Looks like she is going to fit right in. Dave D. brings his new copy of "Russian Railroads" and he is teaching us the game as we punch out the bits. Let me tell you right up front, I was looking forward to this game. A "Euro" take on an 18XX game from Z-Man. Well, I ended up on the bottom at the end of the game and I hope I was not too grumpy...maybe just grumpy enough. First, the game took between 3 and 1/2 and 4 hours. To be fair, none of us had played before and there were rules to learn and consult during the game. Just felt like it was 90 minutes of fun crammed into that 3 and 1/2 plus. Next, it felt like one of those games where the rich just continued to get richer. Dave D. and Corinna started in front and just stayed there through the entire game. Todd made a good showing for himself but even he was playing catch the leaders all game. Now to be fair, I don't really care for the "snowball" type of games where you have no real chance to catch up through clever play or something. Now for my new house rule. No getting paper, or a calculator to min-max a game. 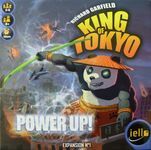 Now I realize that some folks love that (with Indonesia and 18xx being prime examples) but to me, it just holds up the game for everyone else. But, I'll probably never play this game again. 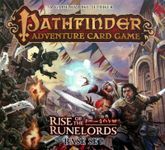 The other table played the Pathfinder Adventure Card Game. I had been itching to play that one and boy I wish I had. Sounded like they were having a great time. I'm hoping someone from that group can provide some color commentary. The pathfinder group, plus Ken broke out this classic game of bean planting while our game of Russian Railroads was rolling on. "What you you mean I can't have Cocoa for your Wax or Stink...?" Well you can not get much closer than that. I'll have to break out Bohnanza again when the family comes over for the holidays. This game has always gotten a lot of play in our group. Todd, Corinna, and Julia sent out to defeat Dawn @ Dinosaur Island. Looks like they did it. Didn't get a chance to be in the last game of this a few weeks ago, so I was happy to jump in a play. Started out strong and took a 36 point lead before anyone else got any real traction. Turned out to be my undoing. I was crossing too many red lines before I got my economic engine up and running well and a lot of expensive buildings came out mid game which put in a constant hole for money. Did have great time though as I always do with my gaming group. Looking forward to the next time we get together.